Plurals. Students respond to task items related to singular and plural nouns depicted in illustrationss. Presente progressive. Students practice formulating sentences containing is and are as they describe actions depicted in pictures. Past Tense Verbs. Students respond to tasks that require comprehensions and use of regular and irregular past tense verbs. Prepositions. Students practice using prepositions that are needed to describe the position of objects (e.g., on, in, beside, between) as they talk about spatial relationships depicted in pictures. Personal pronouns. Students practice using the pronouns he and she as they describe the action shown in pictures. The manual includes updated versions of popular Grammaroonie games, along with new reproducible game boards and other resources. The reproducible picture cards make it easy to customise the games so that they can meet the needs of students. 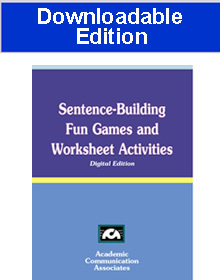 The 118 page manual on the is packed with easy-to-use reproducible worksheets, picture cards, and playing boards. Reproduce them as you need them directly from the file. If you would prefer to have this product on a CD, click on the link below.